There's nothing like freezing rain in February to be deceptively dangerous, so I'm staying snuggled in and toasty at home today - hair appointments, car registration renewals and anything requiring me traveling a further distance than to the front door will just need to wait. So here's an outfit from warmer, drier days - you know, like late January - just looking my bare ankles in these pics makes me shiver a bit right now! Yellow looks soooo good on you Lisa! Aw, thanks! This shade works out for me! We've had amazing weather until Sunday and then it snowed and now it is sunny again! I love your sunny blazer! I don't dig the arctic temps or layer of ice outside, but I'd like a good snow (lived in the SE for too long, I kind of miss the snow, hehe). Oh no, I hope your daughter feels better! Your bright blazer is perfect to combat cold weather! Hope you're keeping warm! My big puffy and thick wool coats are getting a workout! So pretty, loving the color of your blazer! Yeah, no one needs to see me in my practical giant puffer coat and Ugg boots, haha. I'm sorry I missed out on this blazer. It looks great with the leopard shoes and that scarf. Everything about this outfit just blends so perfectly! Thanks! This blazer was a lovely find on Ebay for me! I'm always looking for more - J.Crew has the best colors especially from their old collections, so I am always looking on Ebay. 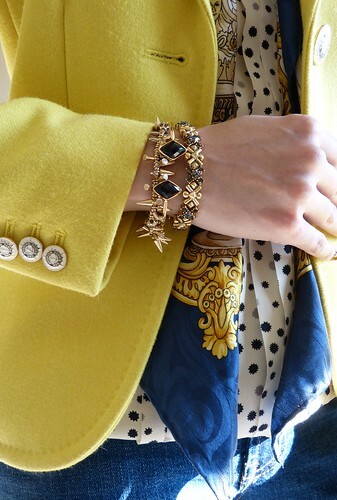 This yellow blazer is fabulous. Just last week I was looking at one in Zara and thought about how great yours fits. Hope warmer days are coming soon. Zara's got some great blazers, I like their fit on me in the shoulders, but they're obviously made for taller women, the sleeves are often too long, wah. Beautiful jacket. Very well styled.